Do you agree with this statement? Think before you answer. Because even if you say yes, your stream might just betray you and tell an entirely different story about your social media marketing strategy. This is a tough principle to get our social brains around, especially if we mistakenly view social media–and any online presence for that matter–not as a platform, but a stage; not as a conversation, but a megaphone. To have real, true and lasting influence online, we have to change our thinking. And the sooner the better. Now, don’t get me wrong. I get why we do it. We don’t understand the nature of social media. We base our understanding on our first screen experience, TV. And TV operates like a megaphone. It’s one-sided. Commercial. And obnoxious at times. Unfortunately, some of us have been guilty of approaching our social communities the same way. I want to challenge us today to change our perspectives. Instead of viewing social media like a megaphone (or a bullhorn) to view it as a one-on-one conversation. I know you think you are talking to a group, a network, your “Twittersphere” (which I checked, and we are no longer saying); but most content is consumed one person at a time. Sure, we may watch a YouTube video in a group or engage through comments, but most often, I’m consuming social media on my phone, by myself, at my convenience. When you think about it, it’s a very intimate conversation. 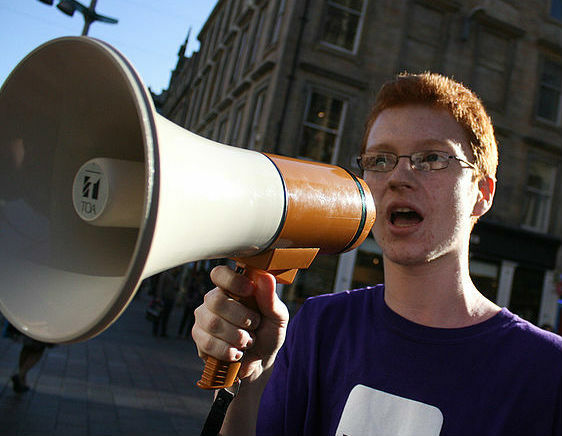 One not appropriate for using a megaphone. When my son was about three, he had this adorable habit. (adorable then, now I’m not so sure!) He would bounce into the room demanding, “Wook-ah-mee. Wook-ah-mee.” (for those of you without kids, that’s three-year-old speak for “look at me.”) At that point, we were to stop what we were doing, usually talking or caring for his baby brother, and give him our full attention. Sometimes it worked. And sometimes we were good parents, and ignored him. The truth is he still commands attention in our family gatherings…and we tease him about it, now that he’s 30 and should know better. How many of us are approaching social media the same way? We run on the scene, demanding others pay attention to us, our cause, our business. And we are surprised when we get ignored. Offer value to the people you connect with. Find a way to encourage, resource, or connect them. That’s what people are truly looking for online. They want to be understood, to be heard, and to find solutions for their own pain points. Furthermore, if we don’t take the time to learn what those needs are and keep talking, we still have a megaphone in our hands, and that’s no social media marketing strategy at all. Let’s face it, it’s time to grow up. If we are serious about making an impact and growing our own “whuffie factor,” we need to throw down the bullhorn and start making conversation. You’ll be amazed at what you learn, and excited to discover how to add your own unique kind of value to the world. Author Bio: Sue Brage is a communications consultant, content coach, and copywriter who helps Christian business owners, entrepreneurs, and nonprofit leaders articulate and communicate their message with more purpose, passion, and clarity. Her blog, BigShoesCommunications and online community provide support, resources, and encouragement to help leaders achieve their goals. I can really appreciate the personal story of your son when he was 3 as my kids are still around that age. I think you are spot on about focusing on personal communication. It seems my struggle is still finding my audience and encouraging the dialogue. Great post, I am now going to turn it to wook-ah-you. Richard, do you struggle finding your audience because you don’t know where they are or because you don’t yet know who your audience is? I know I struggle with that too! I think it can boil down to really understanding the value we offer others…or even believing we have something of value? What do you think?